Barcelona may have won the treble, but there is still plenty of action coming up as the city gears up for some MotoGP action this weekend. 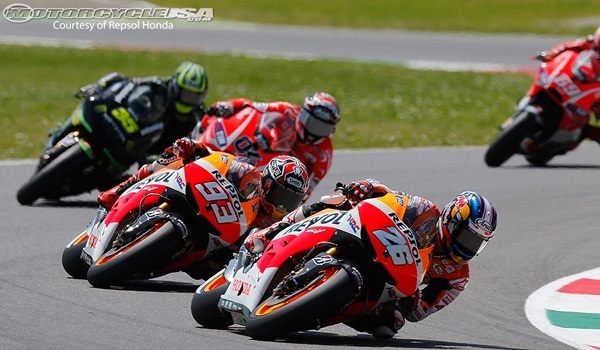 Ita��s a two-man show at the top with only six points separating Yamaha teammates, Valentino Rossi and Jorge Lorenzo. Rossi has had the most wins (46 victories) on the circuit thatA� has seen bikes generate top speeds of 346 km/hr. The Voice India will have judges competing against each other to put together their ideal team of contestants. The new show has a panel of four judges comprising Shaan, Himesh Reshammiya, Sunidhi Chauhan and Mika Singh, who will make their choice from over 100 singers from across the country. Calling all performers from South India, 7UPa��s new show, 7UP Upstarters, is all about finding new talenta��be it dancing, singing, theatre or beat-boxing. Having premiered last week, the six-week show will see teams of seven battling it out. The final will be judged by actors Dhanush and Puneeth Rajkumar. Catch the remaining three days of the first test match between Bangladesh and India. Being held in Fatullah, the match heralds a new era for Indian test cricketa��without the services of Dhonia��as Virat Kohli attempts to start his captaincy stint with a win. Meanwhile, hosts Bangladeshis are also on a high after a series whitewash of Pakistan. This yeara��s edition of Indiaa��s Next Top Model has Lisa Hayden in the judgesa�� panel. Inspired by Americaa��s Next op Model, the show will feature 12 contestants who will be mentored by a panel of models and celebrities. Along with Hayden are Dabboo Ratnani and Anusha Dandekar. Auditions are already underway, while dates are yet to be announced. Cartoon Network, which is celebrating its 20th year in India, has launched a new show, Clarence. It revolves around Clarence Wendell, a happy-go-lucky guy who always sees the good side of things. He befriends Jeff Randell and Ryan Sumo Sumozski, and together they embark on childhood adventures.